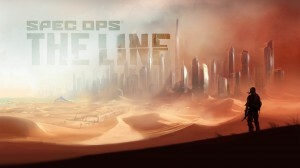 Spec Ops: The Line developed by Yager Development for the single player (I didn’t play the multiplayer) is a third person shooter set in Dubai after a giant sandstorm has forced the evacuation of all the inhabitants. The sandstorm lasted for months and comes back a few times during the game. 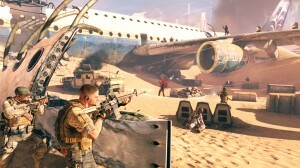 This means the setting is desert areas juxtaposed with high class skyscrapers. If you are familiar at all with Dubai you should recognize a lot of the buildings. What sets Spec Ops: The Line apart from other “shooters” is actually the story. 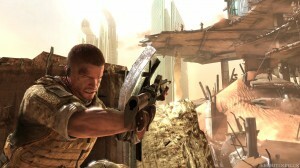 Instead of a group of, essentially, super soldiers you play as the captain of a 3 man Delta Force team. Your team mates will handle themselves pretty well but if you want to micro-manage them you can point out targets you want neutralized as a priority. They are also available to throw a flashbang grenade if you get pinned down. I don’t want to say too much about the actual story of the game because it’s very interesting and to say too much would possibly spoil it. The basic story is that a few months ago a giant sandstorm hit Dubai and crippled the city, most residents escaped in time but several thousand did not. The government sent in a Colonel and his battalion, the 33rd, to lead the survivors out of the area. They were never heard from again until a week before the game starts. Your team is sent in to find the Colonel and evacuate his team and any survivors they found. It is quickly determined that the area is full of hostiles, though it isn’t very clear who they are. There are some really interesting twists in the plot, and at times I wasn’t sure if I was actually playing the bad guy in the story. Sometimes it seems as if it’s my 3 man team against an entire U.S. Army regiment. There are themes in this game that are never explored in any other war game I’ve played, which is really interesting. The combat is pretty fluid and only a few times did I feel it was too much for me to handle, about 2/3 of the way through the game a prompt came up saying I had died a few times in the same area, and would I like to lower the difficulty which I did and didn’t have a lot of trouble with the rest of the game. Seeing as how I play games primarily for their story, I don’t have a problem with playing this game on the lowest difficulty in order to finish it. I could have continued trying to get out of that one fight on normal but it would have mainly lead me to frustration. What I really liked (aside from the story) was the animations. Running into cover looked very cinematic, vaulting over objects was pretty fluid, and when any character is talking his face animates even though there is a good chance you are walking and wouldn’t notice it. It’s the small touches that really immerse the player. The character gets bloodier and torn up as the story proceeds, which is pretty common now in games thanks to Prince of Persia: Sands of Time and Batman Arkham Asylum, among many others. It’s such a simple thing to change the character model for different levels in the game, but it really helps to understand what the characters state of mind would be at this point. I applaud him for saying what I bet many designers feel. It seems common now for a studio to make the game they want, and then be forced to tack on something else to get published. Homefront could have been a better single player game if they didn’t want money on the multiplayer game, Call of Duty games have a very short single player campaign because most of the play happens in multiplayer and as such most players think it’s pointless to even have the single player game tacked on. It seems like one of those things where they figure adding a little bit of everything is the best way to sell a game to everyone, but you just end up letting everyone down a little. After this game I will likely try whatever else Yager Development puts out. Pros: Engaging story, real moral dilemmas that don’t feel contrived or ambiguous, amazing level design and animations. Cons: Difficulty is a bit skewed which makes you feel almost invincible after you single handedly take out 30 soldiers and you stop trying to be cautious and instead rely on reloading if you die.